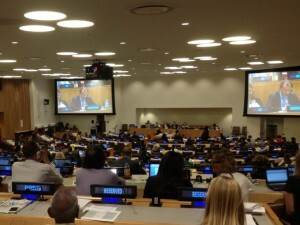 The ninth session of the Open-Ended Working Group on Ageing (OEWG) took place between 23rd and 26th July. At this latest session, a record number of 42 Non-Governmental Organisations (NGOs) secured OEWG accreditation for the first time. In the opening session, one of GAROP’s Co-chairs read the joint GAROP statement, developed in consultation with members ahead of the session. The two new topics of autonomy and independence, and long term and palliative care were discussed from a human rights perspective by Member States, National Human Rights Institutions, NGOs, and other experts present. There was also a discussion on the normative elements of the two topics from the eighth OEWG session – violence, neglect and abuse, and equality and non-discrimination. In this way, the OEWG has now firmly established the method of working that was agreed at its seventh session in 2016. The Chair’s summary of the ninth session will be made available on the official website soon. The tenth session will also include discussion on the normative elements of the topics discussed at the ninth session, independence and autonomy, and long term and palliative care. There is also support from Member States for moving towards negotiated outcomes from future sessions. It is not clear yet exactly what the process would be for achieving this, however, it could provide more concrete agreed outcomes that could act as the foundation for the drafting of a new convention. GAROP members are encouraged to make use of our advocacy tools and join GAROP webinars and events for support in engaging in this process and influencing these discussions. At the eighth session there was a substantive debate led by two panels on two areas of rights: Equality and non-discrimination. and Violence, neglect and abuse. We heard from speakers representing the Office of the High Commissioner for Human Rights; the Australian, Croatian and Polish National Human Rights Institutes; the German government; and a former Chairperson of the Committee on the Rights of Persons with Disabilities. The Independent Expert on the Enjoyment of all Human Rights by Older Persons, Rosa Kornfeld-Matte, also contributed to both panel discussions. In the debate that followed these presentations, a number of NGOs, including GAROP members, took the floor to present their substantive inputs and recommendations for a new convention. At the end of the eighth session the Chair announced that the rights that will be the focus areas in the ninth OEWG session in 2018 will be independence and autonomy, and long term and palliative care. You can also read here the Outcome Report of the CSO Preparatory workshop held on 3 July 2017 ahead of the eighth OEWG session. This seventh session offered an opportunity to hear the Independent Expert, Rosa Kornfeld-Matte, present her comprehensive report on the enjoyment of all human rights by older persons. There were also panels dedicated to regional developments concerning older people’s rights and older people’s rights in recent policy developments and multi-lateral processes. The session also included space for discussion of possible content for a multilateral legal instrument and an interactive dialogue with NGOs. There was broad support from Member States and NGOs for a more substantive discussion on specific areas of rights in the next OEWG session. An important development in this session was the decision to allow the participation and accreditation of National Human Rights Institutions (NHRIs) in the OEWG. NHRIs will now be able to register to attend and speak at future OEWG sessions. Read the full summary provided by the Chair of the session. You can also read here the Outcome Report of the CSO Preparatory workshop held on 11 December 2016 ahead of the seventh OEWG session. This session included panels focused on recent policy developments and initiatives concerning the human rights of older people and recent legislative and legal developments and challenges. There was also a debate about older people and human rights in the post-2015 development agenda. The Independent Expert provided updates about her work. There was some space dedicated to follow up to Resolution 69/146 where a number of proposals for concrete elements for an international legal instrument were made. In this session, a joint statement on behalf of a number of NGOs called for the drafting of a new legal instrument to commence. The fifth session of the Open-Ended Working Group on Ageing took place in New York 30 July – 1st August 2014. The working group was set up in 2010 to discuss the possibility of a new human rights instrument to protect older people’s rights. This year, Member States discussed the human rights dimensions of care, violence and abuse with a focus on older women, financial abuse, and planning for end of life care. There were also discussions on the implementation of MIPAA, the new Independent Expert, the 2014 Human Rights Council Social Forum and the post-2015 process. Civil society maintained its strong call for a new convention and expressed its concern that the OEWGA was not fulfilling its mandate to consider the main elements of a new international instrument. Just over 100 Member States attended; a small increase from 2013. Member States remain divided on the need for a new convention. Only one UN agency – the ILO – attended and made a statement on the need to implement existing standards on social protection and decent work. In his concluding comments, the Chair of the OEWGA pushed for a change in gears now that the 5th session was complete. A twin-track approach was proposed, aimed at strengthening the implementation of existing mechanisms, as well as progressing discussions around the main elements of a new instrument in line with the extended mandate set out in GA Resolution 67/139. The next OEWGA session may happen earlier in 2015 where a working document may be presented. The fourth session of the OEWG on Ageing took place with a renewed mandate of the OEWG as outlined within UN General Assembly resolution 67/139, which asked the group to explore the main elements of an international instrument to protect the human rights of older people. This year Member States discussed the outcomes of the Madrid Plan (MIPAA+10) review, progress on regional human rights instruments in Africa, Europe, and the inter-American region, and finally older people’s rights to social security, health, employment, and non-discrimination. Civil society presence in general was stronger than ever and united in its call for a new convention on the rights of older people. For the first time, this session included an interactive dialogue with civil society, which provided an opportunity for representatives of non-governmental organisations to interact with Member States, voice the concerns and interests of older persons, and provide valuable insights into discussions. In addition to many Member States, the Chair of the OEWG has also acknowledged the invaluable contributions of NGOs’ in this debate. The session provided evidence about the growing importance of the OEWG and was marked by first-time involvement from Member States such as Kyrgyzstan, Haiti, and Mozambique. It showcased pockets of regional cooperation, evidenced particularly by the African Union which voiced one common position as a striking example of collaboration, compromise, and consensus. A final outcome from the session was the proposal put forth by Argentina for the establishment of a group of member states, which would take joint actions as a ‘Group of Friends of Older Persons’. The third session of the OEWG on Ageing drew on the enquiries made by Member States at the second working session, and revisited specific issues and rights of older persons to develop a better understanding of these issues and provide more evidence-based options for addressing them. The third working session consisted therefore of four interactive expert panel discussions on age discrimination; autonomy, independent living and healthcare; life in dignity, social security and access to resources; abuse and violence; with the addition of a new thematic issue namely, access to justice, that was explored in a fifth panel session. In this session there was stronger representation from the Asian and African regions than there had been at previous meetings. The statements of support issued by some representatives from these regions were central to shaping and furthering the discourse. While most Latin American and Caribbean delegates were in favor of new instruments, delegates from European countries, Canada, the United States, and Australia, pointed to the existing programs that their respective countries have in place to help older citizens. This session featured a debate on how best to strengthen the rights of older people, with the representatives of more developed nations arguing for the strengthening of existing human rights instruments and representatives from developing nations—especially those from Latin America and the Caribbean— arguing that the creation of a specific convention is a necessity. There was some convergence throughout the session, however, as EU countries indicated towards the beginning of the session that it was their position that the OEWG need not continue, but eventually reached the conclusion, along with all other delegates, that there is a need for the work to move forward. This session looked in more substantive detail at the rights to health, social security, freedom from violence and age-related discrimination. There was broad agreement on the need to discuss the protection of human rights for this large and growing group and recognition that they have not been adequately addressed to date. Proposals were made on how to improve this including strengthening existing mechanisms, data collection and research; a new special rapporteur on the rights of older people; and a new convention on older people’s rights.